Apple fans absolutely adore the iPhone X. In fact, according to Apple CEO Tim Cook, it has a satisfaction rate of nearly 100%. The new display is gorgeous and using gestures to navigate the phone is awesome. Who needs a home button anyway!? If there’s one complaint some people have it’s the phone’s battery life, which is actually pretty impressive but still can’t always carry you through a full day of very heavy usage. 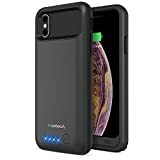 If you want to be sure you never run out of juice at an inopportune time, check out the Maxboost iPhone X Battery Case on Amazon. Powerful 4000mAh Li-polymer rechargeable battery of the Atomic can effectively provide 110%+ extra battery life for your iPhone X, which is equivalent to an added 8+ hours talk time or 11+ hours web-browsing time. Featuring sync-through technology, the case allows you to sync to your computer without ever having to remove the case! Additionally, simultaneously charge your iPhone and battery case together with the included Micro-USB cable. The elegant, slim design of the Atomic Power iPhone battery case provides an exceptional user experience that features: an LED battery life indicator and seamless cutouts to all ports. Compatible with most screen protector. Does not work with edge to edge screen protector. Lifetime warranty by Maxboost ensures the Atomic power case will last as long as your iPhone x 2017.